Paul Davis has written commentary and published the Civil War Diary of Charles H. Safford. "After two days of terrific fighting at Gettysburg, the generals were still not satisfied. Another day of bloodshed was needed to decide a winner and perhaps to settle the fate of the nation." --Earl J. Hess, writing on the Confederate disaster called Pickett's Charge. "The outcome of the struggle remained undetermined," wrote military historian Edward Longacre. And then, the unlikely happened -- like a lightning bolt in a three day fight seared into history by 45,515 casualties. Michigan horsemen rode high in the saddle that day, 3 July 1863, trampling the rebel hopes to split Union lines from the rear as Pickett's legions assaulted the center. The Confederate plan: sweep the North and perhaps capture Washington, D.C. If the rebs were successful, the war would be over and two countries would exist where one had stood before. One nation, at least, would preserve the ancient crime of slavery despite Thomas Jefferson's immortal words: "all men are created equal." Then, on the third day, the Michigan Cavalry Brigade under audacious 24-year-old George Armstrong Custer rose in their saddles and shouted "no!" Robert E. Lee could only moan "this is all my fault" as the pride of the South streamed from the battlefield in defeat. "Re-form your division," Lee pleaded with Pickett. "General, I have no division," said the gallant but hopelessly distraught Pickett. The mists of time continue to roll back for historians who increasingly realize: the moment of truth came precisely at 3:30 p.m. 3 July 1863 at the crossroads of Hanover and Low Dutch roads. Had Jeb Stuart's First Virginia Cavalry been able to crash through the back of the Union line while George Pickett's 13,500 infantrymen assaulted the Union center, the Confederacy may have won the war then and there. A stake would have been driven into the heart of Lady Liberty, blood soiling her flowing robes. Paul Davis has defined the role of the Michigan Cavalry Brigade on the third and final day at the Battle of Gettysburg 152 years ago this week. In his new book "I Rode With Custer," Davis celebrates the Sesquicentennial of the Civil War by "keeping green the memory" of Bvt. Major Charles H. Safford of the 5th Michigan Cavalry. Davis, department of Michigan commander, Sons of Union Veterans of the Civil War, makes an important contribution to the historiography by compiling Safford's letters, newspaper clippings, historic photographs and other documentation of that battle and others. Davis is an active Civil War re-enactor and has appeared in several movies. He is one of the founding members of Bay City's 7th Michigan Cavalry Civil War Round Table. A native of Lockport, New York, Safford was a 24-year-old living in Detroit when he enlisted in August, 1862 "in the struggle for the Union," as he termed the war. Safford's diary and notes kept during the war echo over the century and a half since the last shots were fired. "We thank him for his efforts so we can now share his words and experiences today," wrote Davis. The Michigan Cavalry Brigade, led by George Armstrong Custer, was able to stop Stuart's four brigades of what was said to be the best cavalry in the world. The rebel leaders included Wade Hampton and Fitz Lee, winners of dozens of battles. The 7th Regiment of the Michigan Brigade numbered Lt. James G. Birney IV, grandson of the Bay City pioneer and abolitionist leader. He was injured, captured and immediately escaped. Besides Birney, the lone representative of Bay County, half a dozen officers of the 7th were from Saginaw County. Among them were 1st Lt. Lewis Carson, Capt. William H. Clipperton, Capt. Daniel H. Darling, 1st Lt. Rolla Glover, 1st Lt. Joseph L. Mead, 1st Lt. Robert Sproul and Capt. Bradley M. Thompson. The First, Fifth, Sixth and Seventh Michigan Cavalry lined up under Custer's orders: Listen! You may still hear the grating of metal as hundreds of swords are pulled from their scabbards in unison. Then, the thundering charge -- a blue wedge driven deep into a gray column, described by Col. Russell Alger as "the most gallant charge of the war." 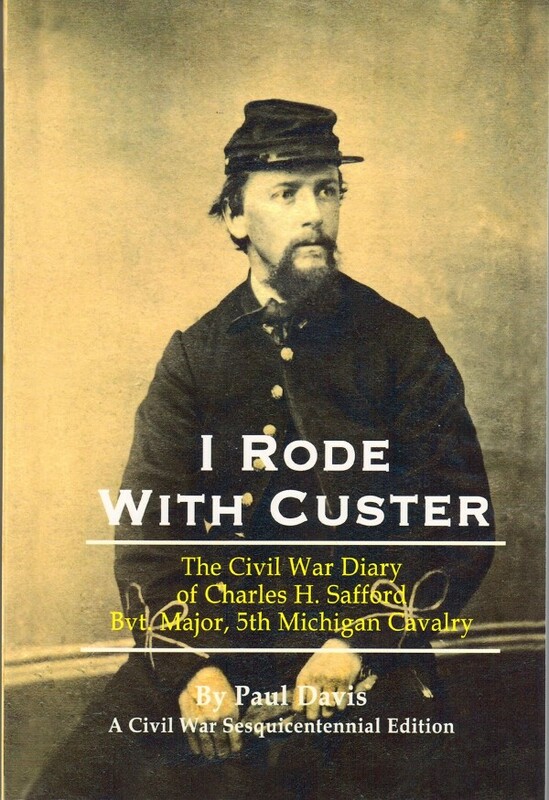 Safford recalled in his diary: "The rebels could not stand such terrible and rapid blows and were forced to leave the field in haste and confusion..."
"The determined resistance and the impetuous onslaughts of the Michigan Cavalry Brigade," were cited after the war by Capt. Charles King. "None are entitled to more laurels for the part performed on that historic field than the Seventh Michigan Cavalry. "What soldier lives who does not envy Michigan that day?" The high water mark of the Confederacy had crested and receded. The rebels retreated to Virginia, battered but not yet beaten. That would take another two years until another Birney, Maj. Gen. William, heading black troops confronted Lee's remnants of the Army of Northern Virginia at Appomattox. Finally forced by what he called "overwhelming numbers and resources," Lee reluctantly decided to surrender. It was 9 April 1865. "There is nothing left for me to do but to go and see General Grant, and I would rather die a thousand deaths," said Lee. But the war was finally over and the events of Gettysburg that fateful day of 3 July 1865 still echoed over the final battlefield and resonated across the years even to now.